Ed and I declared the first week of October as No Diet Week. 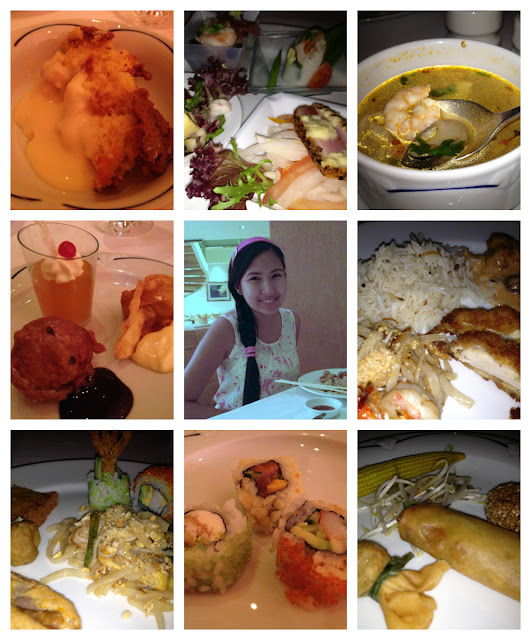 We both love to eat, and that week was the peak of our gastronomic escapade. 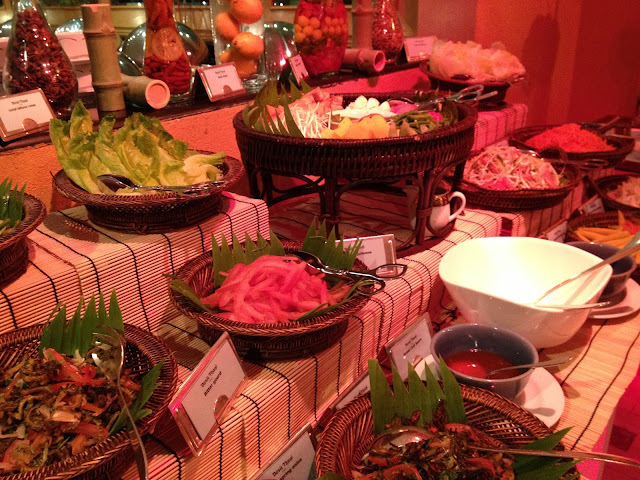 We had four buffet meals in five days!!! 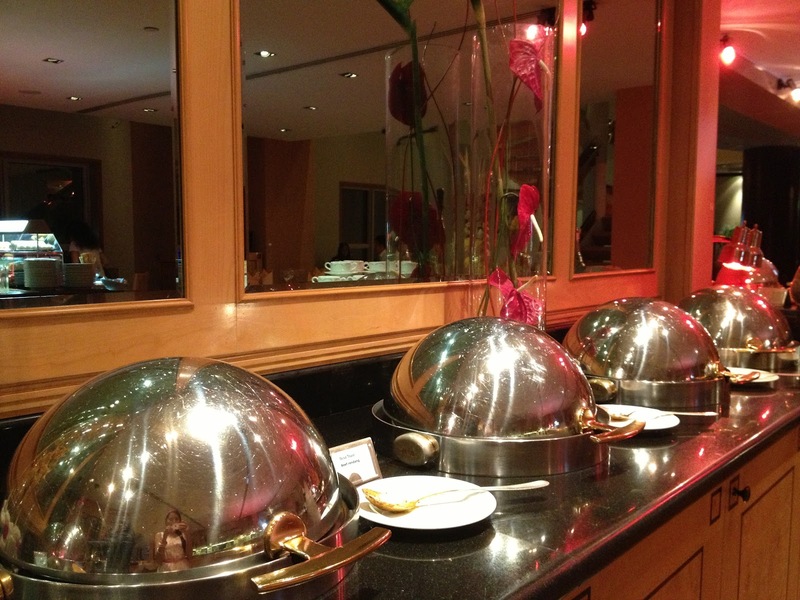 If there's an expertise badge on Buffet Dining, I'd probably have one now! =) It all happened because my Birthday and our Anniversary fall on the same week. 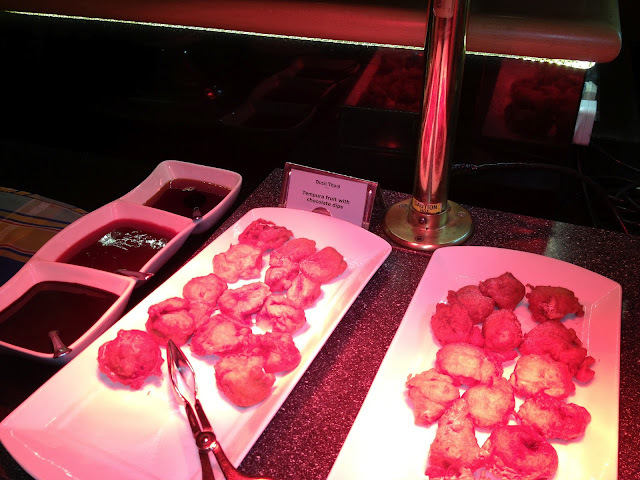 We had Seafood buffet on my Birthday, International buffet for breakfast and dinner on our advanced Anniversary getaway, and Asian buffet on our Anniversary night. 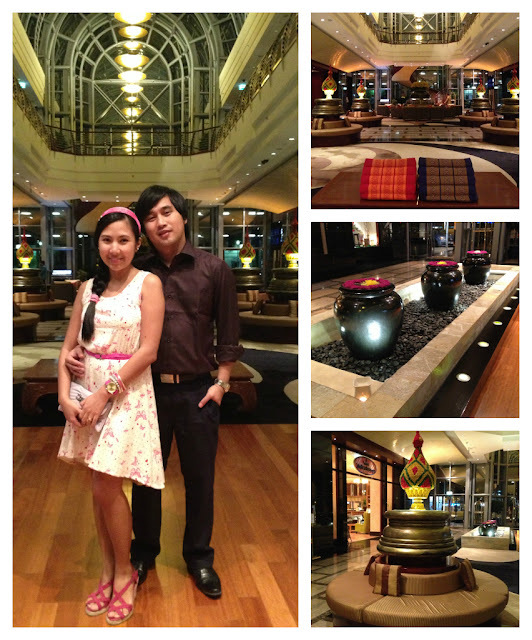 We celebrated the 1st year of our blissful married life at Dusit Thani. 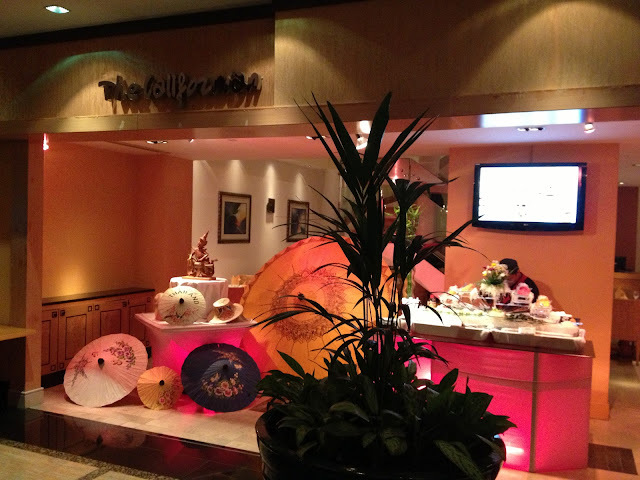 Out of the many restaurants in the hotel, we chose to dine at The Californian because of the South East Asian theme on Monday nights. I used my phone's camera to take the photos. Sorry for the low quality! 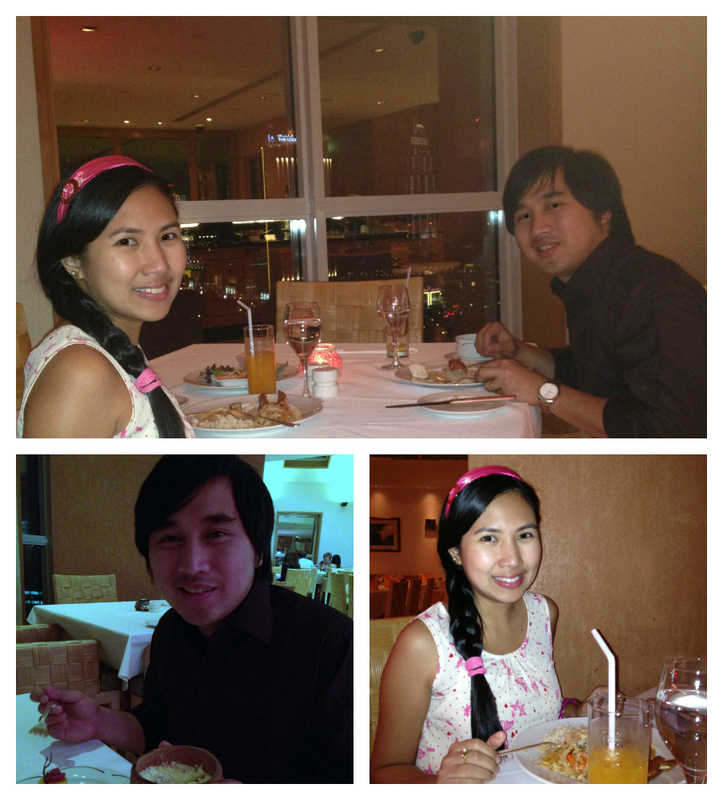 The table reserved for us was near the window, overlooking Downtown Dubai. 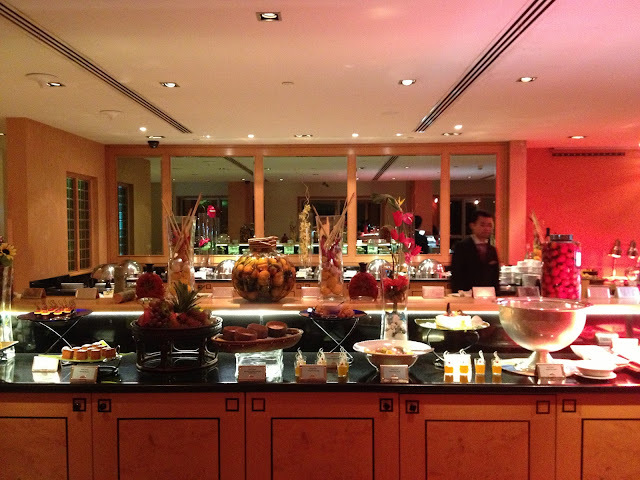 The restaurant is on the 24th floor, we had an awesome view Burj Khalifa , The Address hotel and Dubai Mall. What's even more amazing? 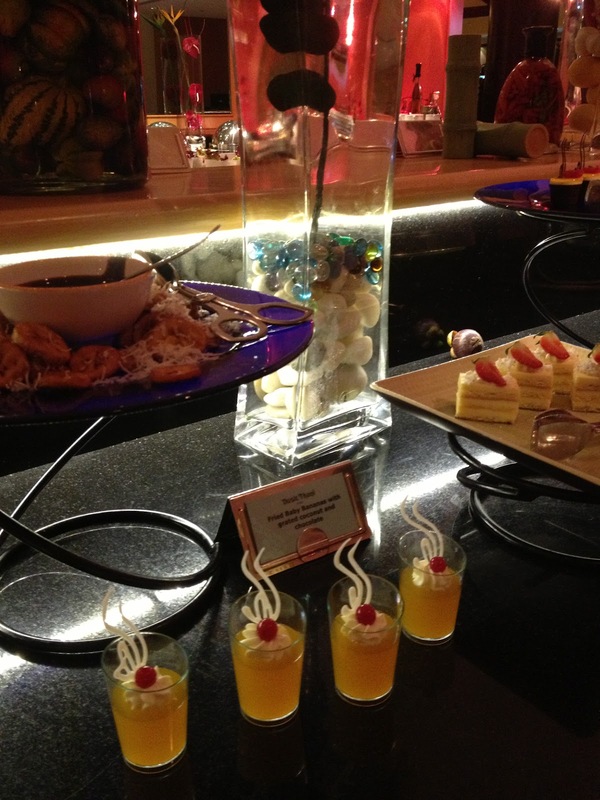 We were seated near the dessert station! Terrific! I could reach out my hand to grab a sweet or two. But of course, I was able to tame the monster with a sweet-tooth in me. 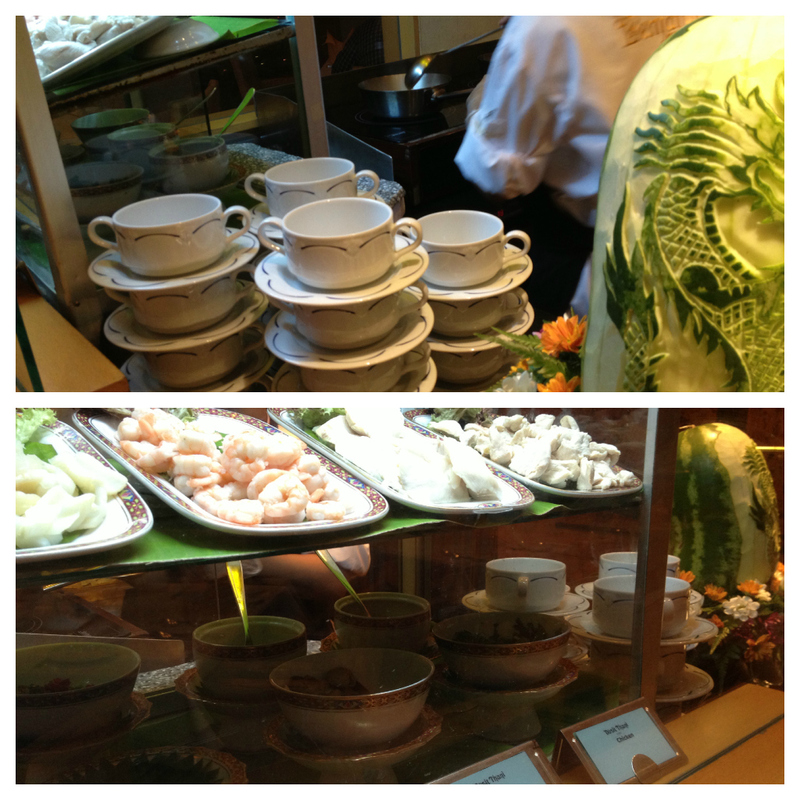 And there was a table of Asian Vegetables: squash in cubes, Chinese cabbage, bean sprouts, string beans and some sauce. 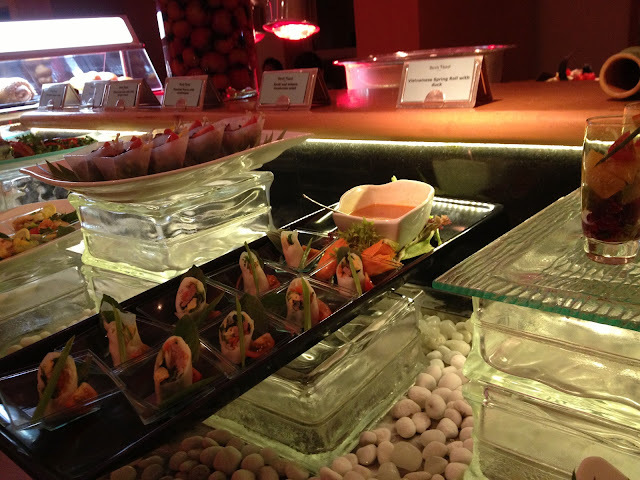 The buffet station of gourmet appetizers was beautifully arranged. Even the simple Asian starters looked so special. Exactly at the restaurant's entrance, there's a sushi station. All types of sushi were prepared right before my very eyes. 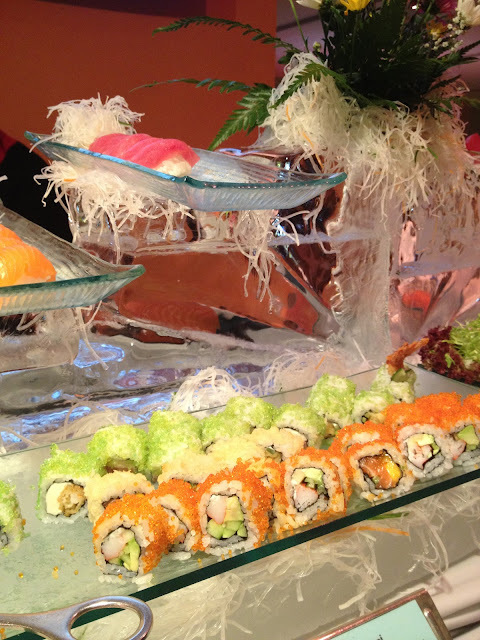 It was the star of the buffet for me, went to this haven of California Maki twice! 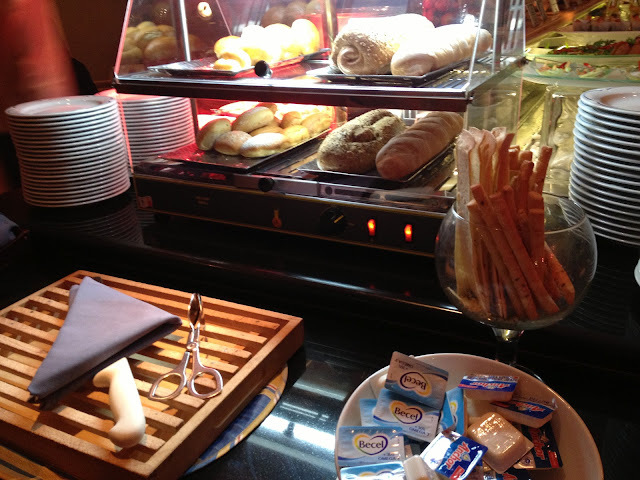 Because I have an Expert Badge on Buffet Dining (awarded it to myself, hahaha), I don't eat bread on buffets! Even a single slice can be heavy, I want my tummy to have enough space for the main course and desserts. And besides, I can eat those on regular days. The main course choices were impeccable! 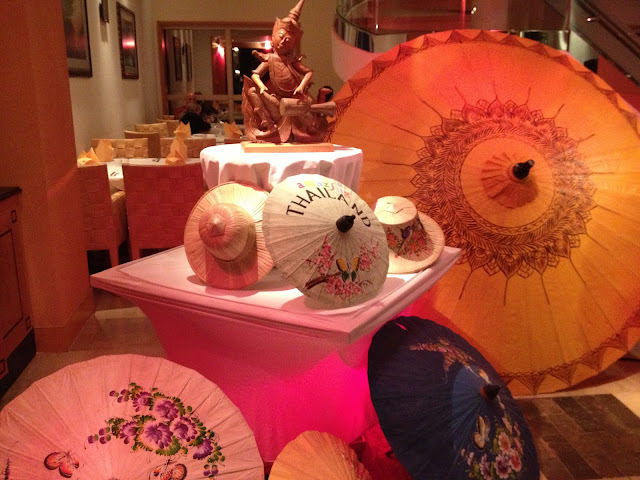 My favorites were Roasted Duck Curry and Pad Thai. The food presentation depicted the night's theme. 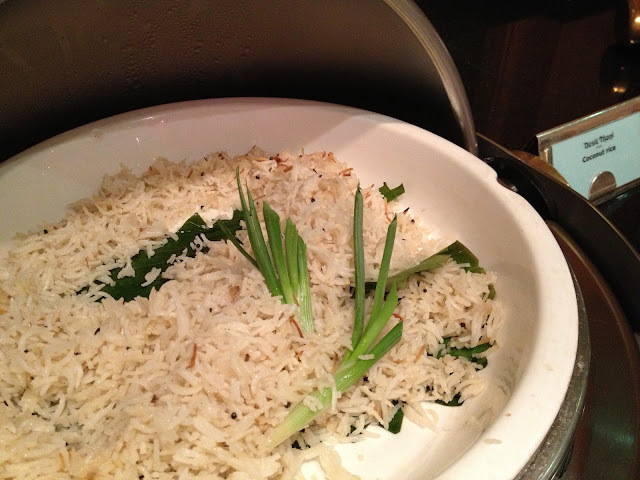 Even the rice was served on a banana leaf! 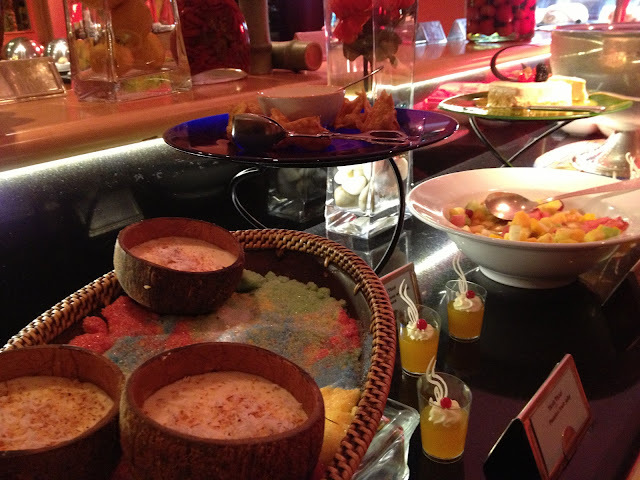 And there was a dessert in a coconut shell ! ...fried bananas with grated coconut and chocolate, passion fruit jelly and assorted cakes and pastries. I can't hardly believe I went to the buffet table 8 times that night. I truly deserve that Expert Badge, huh?! No vouchers and no discounts. It was our Anniversary dinner date, we deserved the lavish treat. The friendly staff at the concierge offered to take our photos at the hotel's lobby. Happy Anniversary to both of us. Those food are really delicious. :) I'll have my chances of eating it. Thanks for dropping by Khim! Happy Anniversary! It's completely ok to splurge once in a while. Cute outfit! Happy Anniversary to both of you. Love the food selection. I felt my stomach growl as I look at the photos. Oh, thanks. Glad you like my outfit. I actually spent an hour searching for the perfect dress. :) hehehehe! I also drool every time I read food blogs. I feel you! =) Thanks for dropping by Kat! Happy anniversary! Looks like you really had a lot of fun dining! LOL. The dishes look delish! Hahaha that's right no diet when it is anniversary. Those food are yummy. Happy Anniversary! 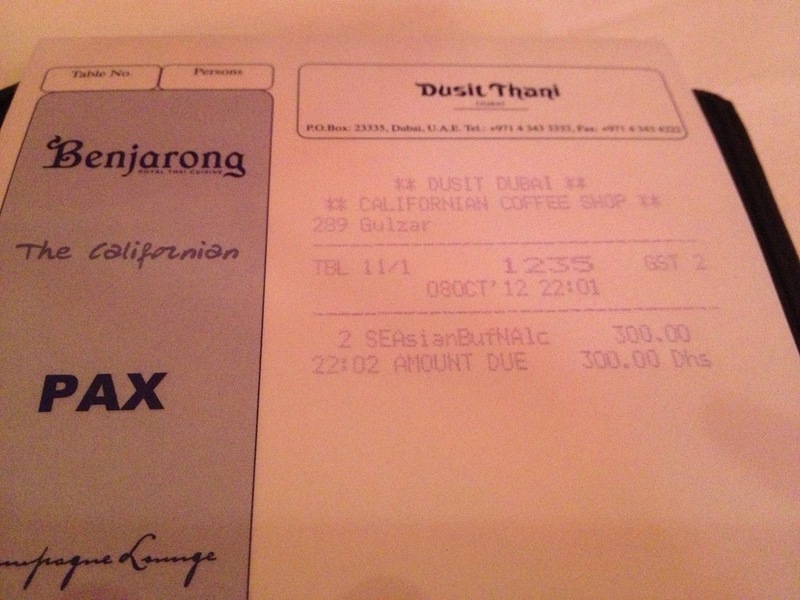 For a long time, Dusit Thani was my favorite hotel and architecture in UAE. It was also the first hotel I entered in Dubai (haven't tried eating there though). You both look great! Happy anniversary! Hmmm, I think I would have stayed at the sushi station all night hahahaha. I love the resto's ambiance. It looks cozy.